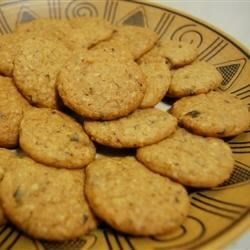 "Spicy cookies with chewy dates. The dates sweeten these cookies without going overboard." In a large bowl, cream together the butter and sugar until light and fluffy. Add the eggs one at a time, beating well with each addition. Combine the flour, baking soda, cinnamon and cloves; gradually stir into the creamed mixture. Combine the water and dates; stir into the dough along with the chopped pecans. Cover and chill for 1 hour. Preheat the oven to 375 degrees F (190 degrees C). Grease cookie sheets. Drop by rounded spoonfuls onto the prepared cookie sheet. If you love dates, you'll love these cookies! My "picky" kid liked these cookies. I chilled for a hour turned out okay for me. i really enjoyed this cookie. I didn't change a thing.